Many of the shrubs that flower in winter and early spring have strongly-scented flowers, so they can attract any lone bee that is out there this time of year. And their scent also draws me outside to appreciate these hardy plants. I’ve planted 3 winter-flowering shrubs together near the house, together with a seat, so I can sit and breathe in the scent. The wintersweet, or chimonanthus praecox ‘Grandiflora’, is a big, rather messy shrub that I have to hack back in the summer to tidy. But it’s worth growing for the delicate waxy yellow flowers appearing on the bare branches in January. It took a few years to get going properly, but now it flowers in abundance and smells wonderful. I have just read in a good article by Ursula Buchan that this is a dome-shaped shrub – so now I know what shape to cut it in this summer! NB Don’t prune it until it is a few years old, or you will delay its flowering even later. You can also train it against a wall. A warm, sheltered position is best, both for flowering and for ensuring it makes it through the winter (it’s frost resistant down to 14F/-10C). Below this is sweet box or sarcococca confusa, a neater evergreen with small dark green shiny leaves, which now is sporting rows of little white trumpet-shaped flowers with long stamens – and another scent to enjoy. Beside this is a wildly sprouting winter honeysuckle Lonicera fragrantissima, with small white honey-scented flowers along long branches. It flowers better against a warm wall. Mine faces south-west, so despite a little shade in the morning, it fits the bill. I may move this so I can appreciate winter scent somewhere else, but for now I just stand and sniff each plant in turn. The wintersweet’s perfume is strongest but each is good. There is also a deep purple-pink hellebore, offspring of one bought in Coton Manor Garden, below all this. The corner has taken a few years to develop but is well worth it now, something to appreciate and tempt me to venture into the garden when there’s little else to see. NB: the yuccas are back in this space too.. see my previous post about this! Great blog! 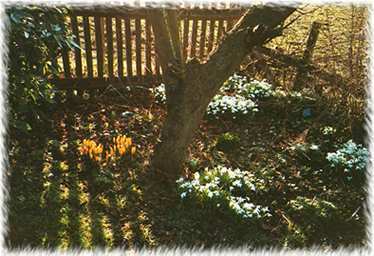 It’s so nice to start smelling the sweet spring flowers and knowing that spring is on its way. Great photos on here too! Thanks Francesca, nice to get some feedback. Today the snow is long gone and I’ve taken another photo with more chimonanthus blossom. It’s pretty warm for February and sunny, and the blossom is smelling more strongly. A bumblebee is out making the most of the weather. Hope you’re enjoying the sun too.